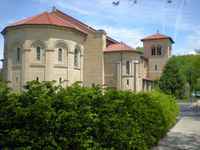 The design of the Finney Chapel for Oberlin College was the beginning of a long and fruitful collaboration between Gilbert and President Henry Churchill King and the college. In January 1903, fire destroyed the old chapel of the college. Frederick Norton Finney wanted to donate a new chapel as a memorial to his father, Charles Grandison Finney, a prominent nineteenth-century Oberlin evangelist, and President King invited him to propose an architect. Gilbert, “a very artistic fellow,” was suggested. When King met with Gilbert in New York in April 1904, Gilbert made a pencil sketch that was very close to the building as it was finally completed four years later. [Christen-2001 p 207] The program called for a dual-purpose building, one suitable for worship as well as a performance space desired by the college's conservatory of music that would seat 2000 people. 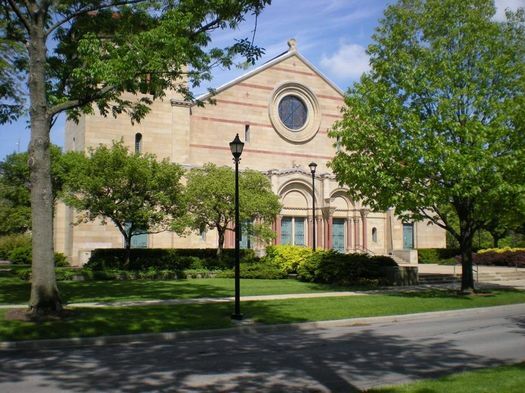 Gilbert's design for the exterior was intended to complement the new gymnasium, designed by Chicago architect Norman Patten with buff sandstone walls and arched openings. It was based on twelfth-century Romanesque architecture of northern Italy, “the simplest and most straightforward type of architecture absolutely without affectation.” [Geoffrey Blodgett in Christen-2001 quotes Gilbert. p 208] The focal point of the exterior design is the front entrance porch at the base of the gabled east facade with its three arched portals that evoke the design of the entrance porch of St. Bartholomew's Church in New York, designed by McKim, Mead & White in 1902. Gilbert had a fully developed design by 1906, but Finney, the donor, was critical. [Christen-2001 p 209] He finally conceded to Gilbert, if the building were completed by commencement in June 1908, the seventy-fifth anniversary of the founding of the college. The exterior of the chapel, faced with smooth sandstone, is minimally ornamented. 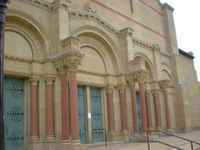 The capitals of the columns flanking the entrance doors were executed by Cleveland sculptor Stephen Gladwin. The interior, except for the wood-beamed and paneled ceiling that concealed the steel trusswork remained largely unadorned. A Skinner pipe organ was installed in 1914, into case work that Gilbert had designed. That organ was replaced by a 4,014 pipe Fisk organ, dedicated in September 2001. The chapel remains in use for purposes of both religious worship and of performance. Geoffrey Blodgett. Oberlin Architecture, College and Town: A Guide to its Social History (Kent State University Press, Kent, Ohio, 1985). Blodgett's guide to the architecture of Oberlin College is the definitive work on the subject.